The Feast of the Annunciation, which commemorates the angel Gabriel’s announcement to Mary that she would conceive Jesus, and the conception of Jesus by the Holy Spirit at that moment, goes back to the fourth or fifth century. Its central focus is the Incarnation: God has become one of us. 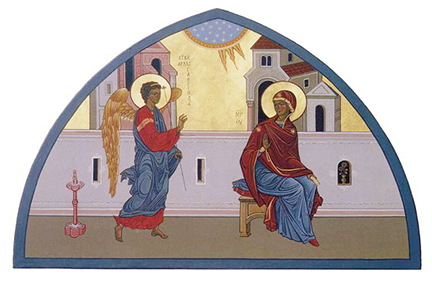 The story of the Annunciation, meaning “the announcing,” is told in Luke’s Gospel. At the Annunciation, the angel Gabriel announces to Mary that she will conceive a Son, and his name will be Jesus. The angel’s greeting, “Hail, Mary, full of grace, the Lord is with you,” has echoed down through the ages in many prayers and is known as the “Hail Mary.” Mary was confused as to how she would bear God’s Son, as she was a virgin. The angel then explains that the Holy Spirit will come upon her. Mary has an important role to play in God’s plan. From all eternity, God destined her to be the mother of Jesus and closely related to him in the creation and redemption of the world. By God’s grace, she becomes the empty space in which God could act. She quietly received the revelation into her depths and let it call her forth in the complete harmony of a yes, the perfect yes of love. She allowed to deep mysteries that had been revealed to her to form a heart in her that would be able continuously to say a complete yes. Hers was the open space of a question, wide open to whatever God would ask of her. Hers was an openness and yes to God big enough to allow God to become incarnate within her. As a young Jewish person, she pondered the scriptures, and entered more and more deeply into the longings of her faithful people. Steeped in the religious traditions of her people, she believed in God and God’s nearness to human life. She was open, receptive, and ready to respond when God called. Once aware of what God was asking of her, her attitude was simple: “Be it done unto me according to your word.” As a culmination of Mary’s constant fidelity to the grace of the Holy Spirit, she is led to consent to the Incarnation, which came to fruition in her giving birth to Jesus. In Mary’s cooperation with God’s plan of salvation, God’s compassion becomes flesh in our world. Since she has made possible this union of God in Christ with all of humankind, no area of human existence is left untouched or unaffected by God’s grace. Such contemplative realization of God’s presence to us helps us appreciate that we are living the mystery of God. Such an experience of mystery does to lead to a withdrawal from the world, but rather challenges us to participate in the work of bringing about the Kingdom of God. It is an invitation to hear the Word of God and live out that Word in compassionate action, just as Mary did in response to the Annunciation.